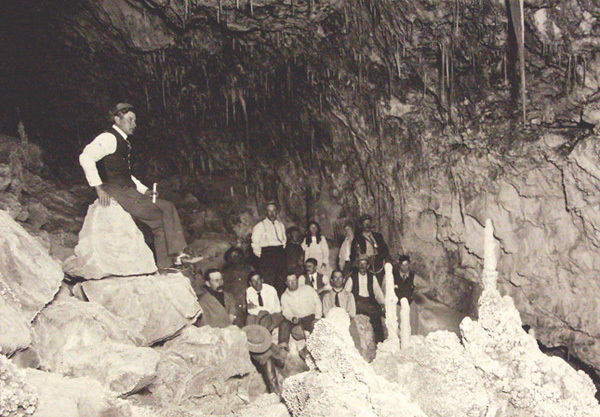 here is a rich history associated with the Cathedral Cave preserve. The earliest signature that we have found in the cave is 1905. It seems there were a fair amount of trips in the 1920's & 1930's due to the increase of signatures from those years. Interestingly we have found two lantern oil cans hanging in a tree near the cave. These oil cans were from the Santa Fe railroad line that used to pass through Ashfork, Arizona. As you can see from the picture below visitors used candles and even a carbide generator from a 1908-1915 Model T to light the cave. Some of the names of people in this picture include Dr. R.J. Roper, O.A. Hesla, Brownie Gentry, Barney Smith, Blanche Foster, Mr. & Mrs. F.W. Foster, and A.D. Barnhart. We would be very interested if anyone knew more about these early visitors, or if there are more pictures or written accounts of these trips. You can contact us here if you wish to help. We hope to someday publish all of this historical information in a book about the cave.